A conventional stopwatch calculates running time and splits, and may include newer features such as heart rate monitors and distance traveled by means of a pedometer. But what happens when you have a GPS enabled watch that can accurately calculate distance, and well as elevation drops? 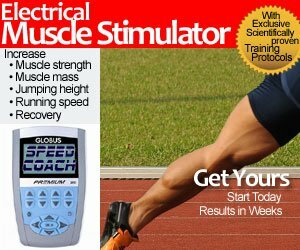 This would come in handy when you don’t have accurate mile markers along the course with a built in “lap counter every mile”. And what happens when you start a race below sea level, and run to the lowest part of America at 282 feet below sea level? 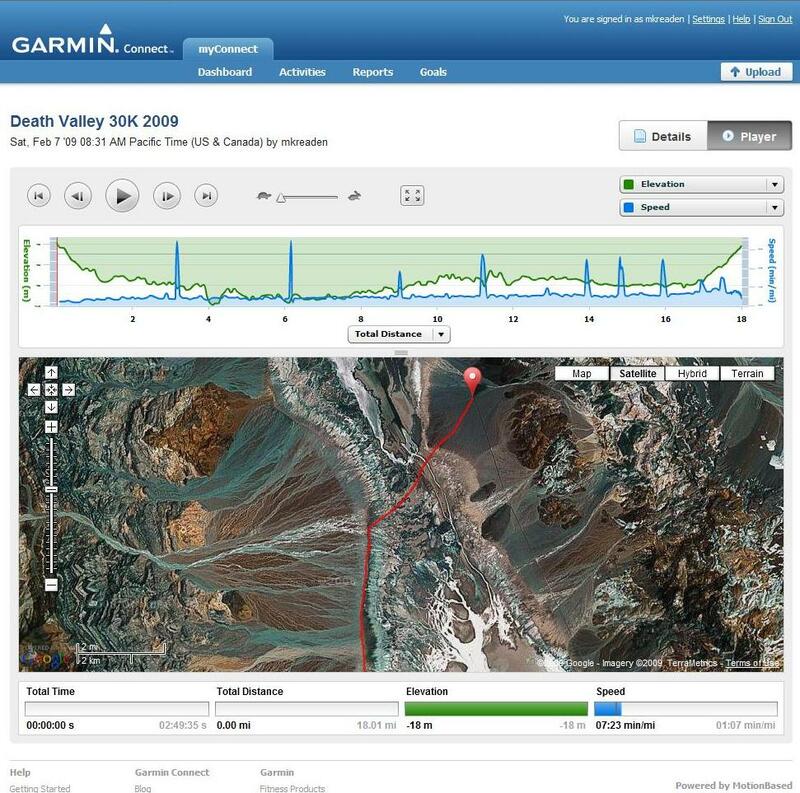 We test drove the GARMIN Forerunner 405 Black GPS Enabled Sports Watch at the 2009 the Death Valley Marathon. In this review, the runner ran the 30K race or just over 18 miles. Unfortunately, the 2009 course through Titus Canyon was closed due to 15 inches of snow! So the alternate course was run on the West Side Road in the heart of Death Valley through the Devil’s Golf Course on the way to Badwater. The route at this time of year is surrounded by snowcapped mountains with views of the Artist’s Palette, as seen below. 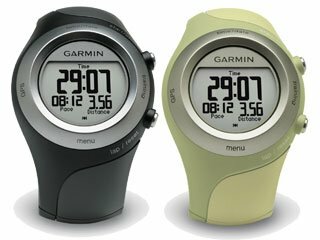 What the heck is the GARMIN Forerunner GPS Sports Watch? Their motto is “Run, Sync, Store and Share”. All your workouts can be stored on line – so no need for a workout log! With the GARMIN Forerunner 405 Black GPS Enabled Sports Watch/ HRM , you’ll have no extra cables to worry about; all the data is stored in the watch with a wireless transmitter to the USB antenna (included) to your computer. There is an optional foot pod to track your speed, distance and running cadence indoors when a GPS signal is unavailable, which we haven’t tried. If you know me by now, I would love a device that calculates stride rate, stride frequency, and ground contact time! In 2007, Garmin acquired Motion-based, the largest shared repository of customer-generated GPS-based routes, courses and maps. This, coupled with Google Earth, can yield some spectacular results. 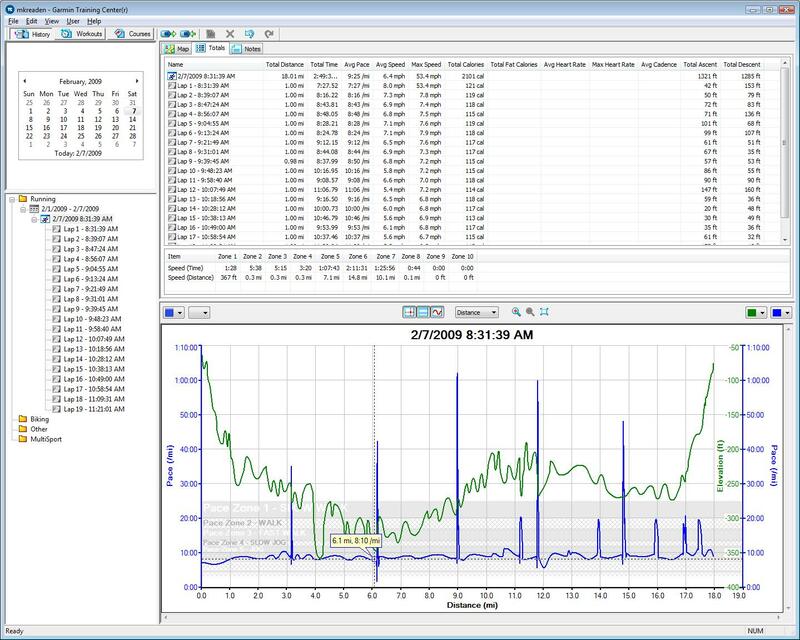 Below are some screen shots of the software. This was an out and back course. You will notice the green line on the graph drops to -350 feet at mile 6, and mile 9 is the turnaround point for the 30K race. The lowest point is -282 feet at the Badwater basin, so there is a slight discrepancy in the elevation accuracy. With the software, you have a “player” and it will track your race using Google Earth in an interactive format. This is a great watch for runners who love technology. My only theory on the inaccurate elevation readings is the lack of satellites in this remote part of the world. The more data points from satellites, the more accurate the result. Great information and example pictures. I am definitely going to get one before I run my next marathon.